Home » All Posts » Hungry Cannibalistic Crab Spider! Chainsaws. Spider fangs. Same difference, right? When you’re the size of a lady beetle, then they may as well be the same thing. Horror has a variety of nasty forms. A rip-roaring chainsaw chews through the air (or something else) like a soulless mechanical glutton. When you hear that motor…papapapapapa…something bad is about to happen. Sometimes you just don’t know when something bad is about to happen. Spider fangs can explode out of the shadows and take down…well…another spider. Because some spiders just don’t care about cannibalism. Crab spiders are mean. And they don’t care what they eat. As long as they eat. Ambush predators sit and wait for their prey to meander within striking distance. Crickets. Grasshoppers. Butterflies. Caterpillars. It doesn’t matter how many legs the prey happens to have—if the crab spider is hungry—then it’s on the menu. Yes…even other crab spiders. You wake up in the morning, and then open a closet. That closet is full of clothes. You can guess what happens next. The crab spider kind of does the same thing…except it dresses to kill. Literally. Ambush predators need to blend into their environment, because it’s highly inconvenient if their prey sees them before they’re killed. Some crab spiders will change their color over time while they’re lounging on top a flower. Ummm…perhaps I’ll change my shade. Go Bite Somebody Your Own Size! Most female crab spiders are much larger than the males…sometimes much LARGER. Sexual dimorphism occurs in a variety of species, but this evolutionary strange twist of fate is exaggerated when it comes to some species of crab spiders. Not only are female crab spiders large and in charge—they don’t mind engaging in mortal kombat—why? Because there’s more than one way to finish him! Remember that. Horror and nature is a two-headed giant. You can’t have one without the other. The next time you walk past a lovely garden…look very closely…something is probably being killed. On second thought…just keep walking. 32 Comments on Hungry Cannibalistic Crab Spider! Those crab spiders are mean and hungry! If you had powers like a crab spider, what outfit would you morph into? Gluttonous change artists! I scream that from afar, from atop a roof of a building with no flowers. Some spiders can use their web like a balloon and drift high into the atmosphere…so make sure you find a really tall building! I would gave to go to Dubai, where the tallest building in the world is located. Perhaps the builder was compelled to build it to avoid those eight-legged critters. “Horror and nature is a two-headed giant.” Food for thought. Thoughts about food. Very interesting article, thoroughly enjoyed. A two-headed giant spider would most likely cannibalize itself…I think. I’ve always thought it was important to observe and appreciate nature. 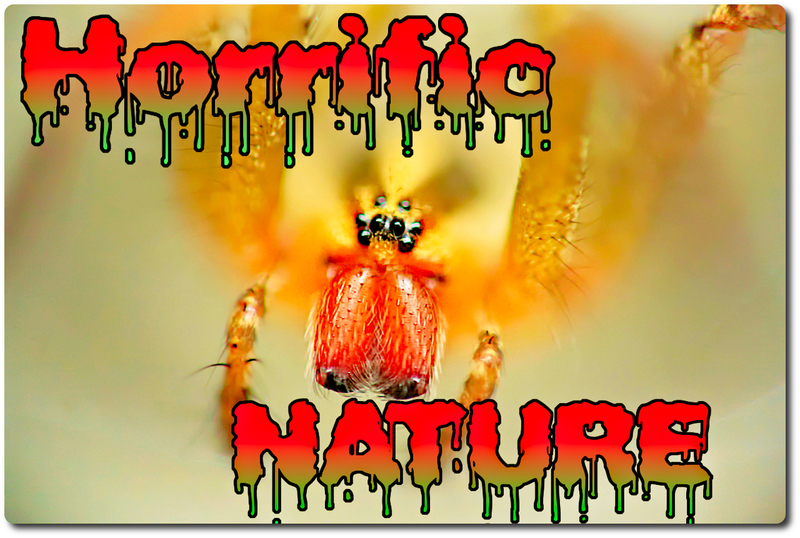 To see the beauty of things like spiders, and how they interact with the world. To derive inspiration from the interestingly grotesque reality of other living organisms by seeing it firsthand, and experiencing the glory of nature instead of staying locked away indoors and having a limited view. I’ve always thought that. This post has convinced me otherwise. Spiders are interesting creatures. They all have their quirks and strange characteristics, especially crab spiders. Sometimes a flower looks innocent…until a closer inspection reveals something with eight legs! Haha. A spider that moonlights as a chameleon…how interesting. I’d rather fill my world with hungry cannibalistic crab spiders than hungry cannibalistic politicians! Politicians eating each other may not be such a bad thing!…depending on the location…and who’s doing the eating. The other white meat, eh? I think I’ll pass on that meal!! Are you sure? It’s a great source of protein! I know, but I think I stick to my current diet – thanks anyway…. Cute? Yeah, why am I not surprised. The next time you sniff a flower…look very closely. Something with eight legs might be look back at you.